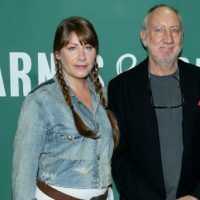 J. Countess/Getty ImagesWith The Who currently on hiatus, guitarist/songwriter Pete Townshend has been spending part of his downtime working on The Seeker, a new stage production featuring original music and lyrics by his wife, Rachel Fuller, as well as additional music from Pete himself. Videos offering a look at the recording of The Seeker‘s soundtrack album are being posted on the production’s official YouTube channel. As previously reported, The Seeker is inspired by the famous Herman Hesse novel Siddhartha, and Pete has a featured acting and singing role as a character called The Ferryman. A video capturing Townshend rehearsing his part also was recently posted on YouTube. The Seeker‘s soundtrack album is due out later in 2018, and the production also is expected to tour this year. For more information, visit TheSeekerMusical.com. Fuller, a classically trained singer and pianist, previously has collaborated with Townshend on a number of projects. She created the orchestrations for the Classic Quadrophenia album and shows, and teamed up with Pete for the In the Attic web series and concerts.